Google Cloud Platform (GCP) projects form the basis for creating, enabling, and using all GCP services including managing APIs, enabling billing, adding and removing collaborators, and managing permissions for GCP resources. This page explains how to create and manage GCP projects using the Resource Manager API and the Google Cloud Platform Console. Read about the project resource in the Resource Hierarchy overview. To create a project, you must have the resourcemanager.projects.create permission. This permission is included in the Project Creator roles/resourcemanager.projectCreator role, which is granted by default to the entire domain of a new organization and to free trial users. For information on how to grant individuals the role and limit organization-wide access, see the Managing Default Organization Roles page. You can create a new project using the GCP Console or the projects.create() method. Go to the Manage resources page in the GCP Console. On the Select organization drop-down list at the top of the page, select the organization in which you want to create a project. If you are a free trial user, skip this step, as this list does not appear. In the New Project window that appears, enter a project name and select a billing account as applicable. If you want to add the project to a folder, enter the folder name in the Location box. When you're finished entering new project details, click Create. Where PROJECT_ID is the ID for the project you want to create. A project ID must start with a lowercase letter, and can contain only ASCII letters, digits, and hyphens, and must be between 6 and 30 characters. You can't use certain words in the project ID when you create a new project with the projects.create() method. Some examples include ssl and google. When you use a restricted word, the request will return with an INVALID_ARGUMENT error. The below request only creates a project, and does not associate it automatically with a billing account. Use the projects.updateBillingInfo method to set or update the billing account associated with a project. If you have fewer than 30 projects remaining in your quota, a notification will display the number of projects remaining in your quota on the New Project page. Projects that users have soft deleted will count against your quota until those projects have been fully deleted after 30 days. To request additional capacity for projects in your quota, see the Request Billing Quota Increase support page. More information about quotas and why they are used can be found at the Free Trial Project Quota Requests support page. Project name: the customized name you chose when you created the project, or when you activated an API that required you to create a project ID. Note that you can't reuse the project name of a deleted project. Project ID: a unique identifier for your project, composed of the project name and a randomly assigned number. Project number: a number that's automatically generated by the server and assigned to your project. Go to the Dashboard page in the GCP Console. Click the Select from drop-down list at the top of the page. In the Select From window that appears, select your project. A project ID is different from a project name. The project name is a human-readable way to identify your projects, but it isn't used by any Google APIs. In the above example, the project name is My Sample Project and the project ID is my-sample-project-191923. 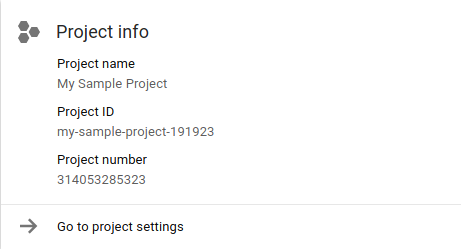 The project ID is generated from the project name you enter when you create the project in the Google Cloud Platform Console. Certain words are restricted from use in project IDs. If you use restricted words in the project name, such as google or ssl, the generated project ID will not include these words. This will not affect the project name. The project number and project ID are unique across Google Cloud Platform. If another user owns a project ID for their project, you won't be able to use the same project ID. When you choose your project ID (or any resource names), don't include any sensitive information in your names. You can get an existing project using the GCP Console or the projects.get() method. Go to the Dashboard page in the Google Cloud Platform Console. Where PROJECT_ID is the ID of the project you want to view. You can list all projects you have access to using the GCP Console or the projects.list() method. Go to the GCP Console. All your projects are listed in the projects drop-down on the top bar. Use the Search projects and folders textbox to filter projects. To list all your projects, click Manage Resources. Use the Filter by name, ID, or label textbox to filter your projects. This command will provide the project ID, name, and project number for every project for which you have Owner, Editor, or Viewer permissions. The above command will return all projects for which you have Owner, Editor, or Viewer permission for, and also include the word "test" in the name, project ID, or project number fields. If you specify a filter that has both the parent.type and parent.id fields, then the resourcemanager.projects.list permission is checked on the parent. If the user has this permission, all projects under the parent will be returned after the remaining filters have been applied. If the user lacks this permission, then all projects for which the user has the resourcemanager.projects.get permission will be returned after remaining filters have been applied. If no filter is specified, the call will return projects for which the user has resourcemanager.projects.get permissions. For more information on filter syntax, see gcloud topic filters. You can include fields in the body of your request to return specific Project resources that match the filter and for which you've been granted the Owner, Editor, or Viewer roles. If you specify the parent.type and parent.id fields in your request body, then the resourcemanager.projects.list permission is checked on the parent. If the user has this permission, all projects under the parent will be returned after the remaining filters have been applied. You can update projects using the GCP Console or the projects.update() method. Currently the only fields that can be updated are the project name and labels. You cannot change the project ID value that you use with the gcloud command-line tool or API requests. For more information about updating projects, see the project API reference page. Open the Settings page in the Google Cloud Platform Console. At the top of the screen, click the project selection drop-down list. On the Select from window that appears, click the organization drop-down list and then select your organization. Select your project from the list that appears. To change the project name, edit Project name, then click Save. To change labels, click Labels on the left nav. Learn more about Using Labels. Where PROJECT_ID is the ID of the project you want to update, and NAME is the new name you want to assign to the project. Get the project object using projects.get() method. Modify the field you want to update. Update the project object using projects.update() method. You can shut down projects using the GCP Console or the projects.delete() method. This method immediately marks a project to be deleted and sends a notification email to the project owner. A project that is marked for deletion is not usable. After approximately 30 days, the project will be fully deleted. To stop this process during the 30-day period, see the steps to restore a project. Warning: You can recover most resources if you restore a project within the 30-day period. Some resources, such as Cloud Storage resources, are deleted much sooner. These resources might not be fully recoverable even if you restore the project within the 30-day period. At the end of the 30-day period, the project and all of its resources are deleted and cannot be recovered. Until it is deleted, the project will count towards your project quota. If you have set up billing for a project, it might not be completely deleted until the current billing cycle ends and your account is successfully charged. The number and types of services in use can also affect when the system permanently deletes a project. To learn more about data retention and safe deletion, see How Google retains data we collect. The project must not have a billing account associated with it. The project must have a lifecycle state of ACTIVE. Open the Settings page (found under IAM & admin) in the Google Cloud Platform Console. Select a project you want to delete, and click Open. Enter the Project ID, then click Shut down. Where PROJECT_ID is the ID of the project you want to delete. Project owners can restore a deleted project within the 30-day recovery period that starts when the project is shut down. Restoring a project returns it to the state it was in before it was shut down. Cloud Storage resources are deleted before the 30-day period ends, and may not be fully recoverable. Some services might need to be restarted manually. For more information, see Restarting Google Cloud Platform Services. Go to the Manage Resources page in the Google Cloud Platform Console. In the Organization drop-down in the upper left, select your organization. Below the list of projects, click Resources pending deletion. Check the box for the project you want to restore, then click Restore. In the dialog that appears, confirm that you want to restore the project.